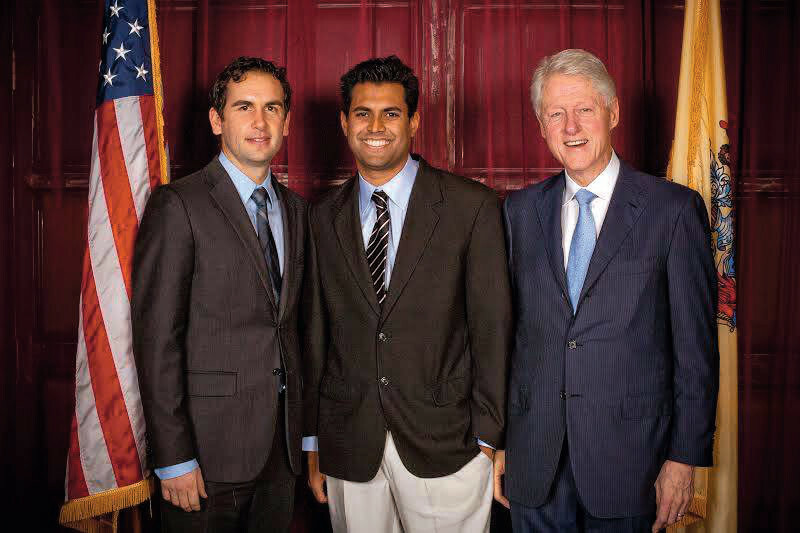 Vin Gopal, center, with Jersey City Mayor Steven Fulop, left, and former President Bill Clinton at a reception hosted for the mayor in December 2013. Vin Gopal, 31, described as “a dynamic Democrat in a Republican Combat Zone” officially announced his candidacy for the New Jersey state Senate Jan. 3. PolitickerNJ aptly described the Indian-American in those terms in 2015 in its list of ‘40 Under 40.’ Gopal, a small business owner will be facing off against Republican incumbent Jennifer Beck, 49, who was elected to the Senate ten years ago and has since won with resounding victories, including after the 2011 redistricting. Gopal hopes support from the Indian-American community around the state will bolster his chances. Gopal has his work cut out for him and said he will resign his voluntary post as chairman of the Monmouth County Democratic Party almost immediately, to focus on his race for the Nov. 7 elections. “I hope Indian-Americans will get excited about my race,” Gopal told Desi Talk. According to his math and that of another Democratic source who did not wish to be named, Gopal’s chances are good despite a secure incumbent Republican (Beck won her last election with 60 percent of the vote). “Hillary Clinton won by 8,000 votes,” in the presidential race Nov. 8 Gopal says. Also, Gopal is credited with securing a victory against considerable odds in 2015, for the two current incumbent Democratic Assembly members Eric Houghtaling and Joann Downey in a Republican district, who will be running for re-election this November. “Also, there are South Asians who live in Freehold and Ocean Townships who could help,” Gopal said. 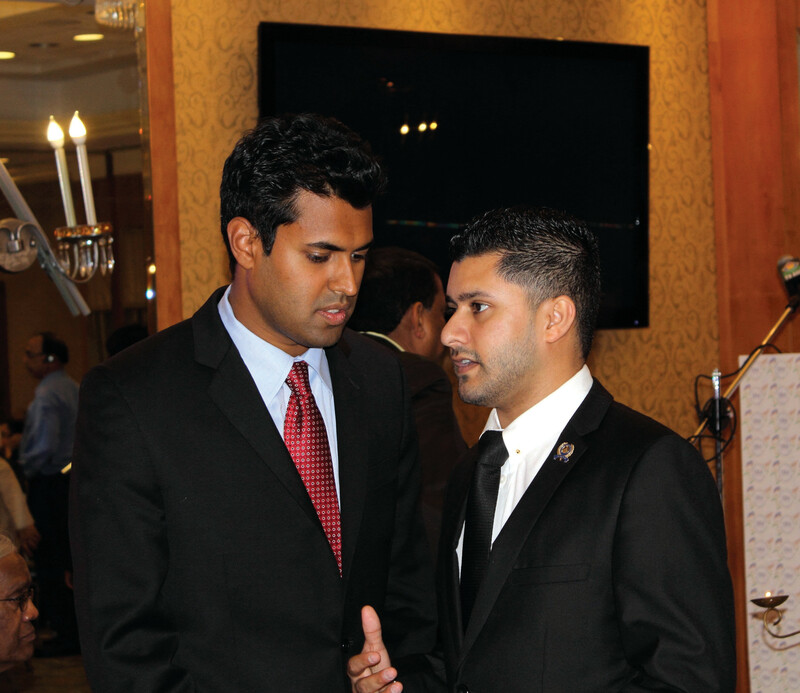 Gopal with New Jersey State Assemblyman Raj Mukherji. According to 2010 U.S. Census figures, District 11 has a population of 205, 526, of which more than 79 percent are of voting age. 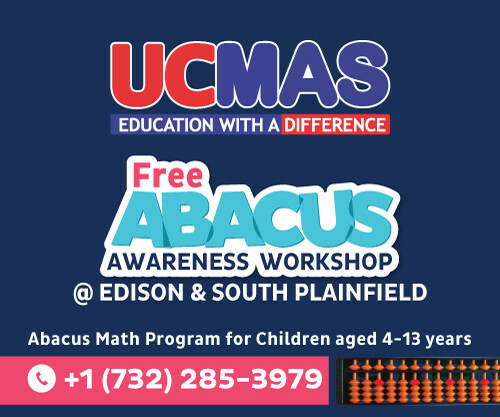 Unlike some other parts of New Jersey where Indian-Americans or Asian-Americans make up a sizable part of the population, District 11 is 76 percent White and barely 2.74 percent Asian. Blacks make up a little over 14 percent. While racial or ethnic breakdown of the population may have changed since 2010, Gopal will need outside help for what is expected to be a $2 million dollar campaign all-told for the three Democrats. An extra Democrat on the state Senate would be a definite plus for liberals. 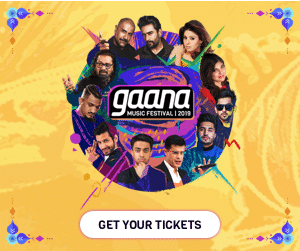 “Indian-Americans and South Asians outside the district could also be a help,” said Gopal, a small-business owner, founder of the communications company Direct Development in Hazlet, N.J., which has 14 employees. In his statement announcing the candidacy, Gopal said he has gone without taking a paycheck in order to make the payroll. He will continue in his ‘day-job’ running his successful company Gopal told Desi Talk, one which allowed him to purchase a $900,000 commercial property in Tinton Falls, N.J. recently, according to MoreMonmouthmusings.com. 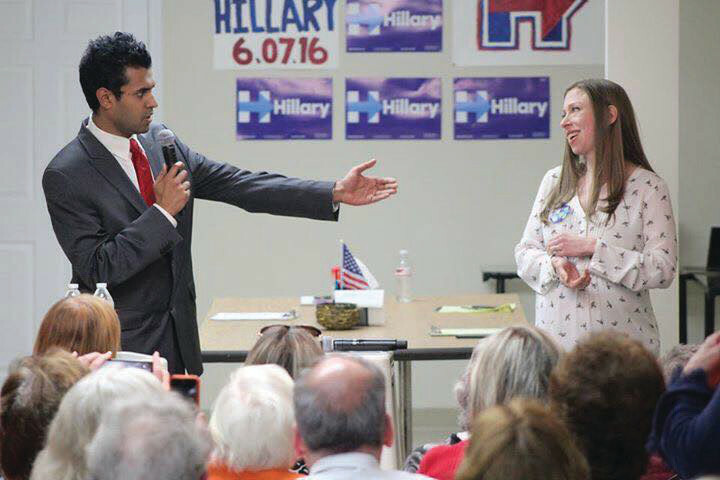 Gopal introduces Chelsea Clinton at a campaign rally in Monmouth County earlier this year. Gopal graduated from Penn State University and used to be on the Board of Directors for what is now the Monmouth County Chamber of Commerce where he chaired the Chamber’s Government Affairs Committee. He is a past-president of the Hazlet Township Business Owners Association, and a past-board member of Big Brothers Big Sisters of Monmouth County. A former volunteer Emergency Medical Technician, Gopal volunteers with the Long Branch Fire Department. He also founded a 501c (3) organization that aims to help local charities and individuals in need. “We need to look at jobs creation, diversity, development and re-development,” Gopal said. Mukherji noted Gopal would “double” the South Asian membership in the state legislature if elected. “And he will instantly become the tallest and best-looking South Asian there,” Mukherji joked. Above, Vin Gopal, center, with Jersey City Mayor Steven Fulop, left, and former President Bill Clinton at a reception hosted for the mayor in December 2013. Left, Gopal with New Jersey State Assemblyman Raj Mukherji. Below, Gopal introduces Chelsea Clinton at a campaign rally in Monmouth County earlier this year.